Lots of women are asking the same questions: “Why don’t I have any or as many women friends as I’d like?” and “How do I go about finding some new women friends?” Read on to find the answers. I have a Google alert set up that notifies me daily to any new articles that hit the airwaves regarding women and their friendships. And daily, I am not disappointed, as there are a ton of stories written on the subject and published on blog posts and major women’s websites. The reason for the apparent popularity of the subject, friendship, and especially friendships between women, is extremely important. 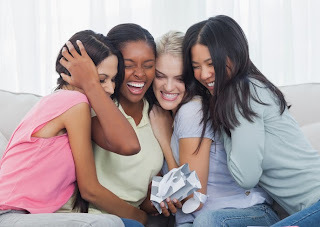 Those who write about women and friendship often start with titles such as, “9 Signs She’s Your Best Friend,” or “Getting Over a Gal Pal Break-Up,” or “The 5 Health Benefits of Friendships.” I know this because I’ve written very similar articles myself. The reason that so many articles are written about friendships between women is that it is an important topic. Friendship not only improves the quality of our lives, it also improves our health, significantly and especially for women. Study after study confirms this. The truth is that a lot of women want and are in search of new friendships. Honestly, if you find yourself in this same situation or with this same desire please know that you are not alone, and actually, are not in the minority. A host of research done on the topic confirms this position. The US Census General Social Survey found that 25% of Americans report that they only have two close confidants, and of those two, one is usually a spouse. It also found that 20% of Americans claim that they suffer from loneliness, a situation that isn’t much reported due to its unpleasantness. But regardless of how unpleasant, it still is a fact. These are women are on top of their games and are among the best communicators and networkers in the world. If they are telling you that even they can only count one or two gals on their best friend list, than this gives us a pretty good indication of just how rare these relationship are. Finally, the truth about friendships is that most are not long lasting. A Dutch researcher found that on average, friendships last about 7 years, or rather that within a 7-year timespan, a third of our social network changes. These turnovers happen for a number of reasons, some personal, some situational. Just as there are a plethora of articles written about female friendship, so too are there an endless supply of books on the subject. And some of these books will tell you that the reason that you, in particular, are low in the friendship department has something to do with you. Don’t buy into this hype. I’m here to tell you that the reason that you haven’t filled up your allotted speed-dial slots has more to do with your current situation than with any flaws in your personality. Society in America has changed dramatically in the last several decades. Specifically, we marry later, and then divorce more often than not; we move more frequently and to further destinations; we work longer hours and spend more time commuting to and from work; we aren’t as dedicated to our religious communities, and we have smaller families, which we don’t live as close to anymore. All of these factors lead us to live less connected lives, and all of these factors make establishing and maintaining good friendships difficult. The problem is not rooted to your lack of non-verbal communication skills, it is rooted in your lack of placement in a good community, because communities are where we find new potential friends. The definition of a community is a feeling of fellowship with others, as a result of sharing common attitudes, interests, and goals. Our communities are found in our religions, our children’s schools, our neighborhood associations, our places of employment, and in our involvement in our activities and hobbies. But what if you are not religious or don’t attend services, what if you don’t have children or have adult children, what if you recently relocated to a new town, and what if you are retired or work at home? And what if all of the above describes you, as it does so many of us? And if you are thinking of making a career change, well then, again, you might check with friends and family about positions they know of, but the quicker and easier path to a new job is found on any of the number of job boards or professional networking communities, such as linkedin.com. So, doesn’t it make sense that when you find yourself in a bit of a friendship slump, finding an online community in which you can networking with others who are also seeking new friendships would probably be a good option for you? SocialJane.com is one such community, dedicated to helping women find and form new platonic friendships. While a new concept (just as online dating was when it started 20 years ago), finding friends online is not only quick, convenient and easy, it will definitely become the go-to way of making new friends over the next several years. Although virtual, online communities are still communities, and again, communities are where we most often make new connections. Using the search functionality on most networking site, and definitely on SocialJane.com too, you can swiftly sort through the masses and find those people who are geographically close, around your same age, who shares similar interests (running, rummaging or gin rummy), or whatever your preferences. Now to answer your questions: The reason that your social circle needs some sprucing has more to do with your situation (lack of community) than with your personality, and the way to make new friends fast is to join an online friendship site (I recommend SocialJane.com). Again, don’t believe the hype: lots of women are looking for and in need of more and new friendships, and there isn’t a darn thing wrong with you except that you aren’t fulfilling your need through an online community. Here is hoping that you fill-up that speed dial quickly.